The teams was friendly and quick to respond. The weather was very hot our first day and we needed and extra fan. They brought one right over! We really enjoyed the house and the atmosphere. We hope to stay at this property next year when we make our next annual visit! We had the best stay in Manzanita at Finley's Cove. We were here for a soccer tournament in Seaside and it was a relaxing and peaceful refuge for us at the end of the day. It is so spacious and clean and relaxing. We were here with two 14 year old boys and an 11 year old boy. It was big enough for them to hang out and for me and my husband to relax and read. The kitchen is well-equipped and there plenty of dishes for anything you may want to cook. There is a wine fridge/cooler in the island which was fun, too. There are plenty of blankets for cozying up on the couch or for colder nights in bed. The gas fireplace is lovely and we read magazines (a nice selection was provided) and talked and really enjoyed the main living room. It is a lovely walk from Finley's Cove to the beach which we did one evening. We ran into neighbors who were so friendly and chatted along the way. 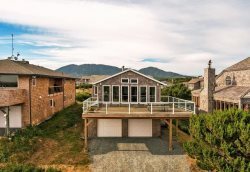 I would highly recommend this spot for anyone looking for a spacious, modern and comfortable stay in Manzanita. Wonderful beach house! Great location; walk to the beach, all the shop & cafes in town. Super well appointed with all that you would need & very clean. We had a great time!!! We all very much enjoyed our stay and would highly recommend this property; well appointed, super clean, very well furnished and charming. Good for a group of people or a family. Your team was very accommodating when we requested to change the date of our trip to a later weekend, thank you! Thank you also for letting us check in a couple of hours early. The location of the house was amazing, a short walk to the town and beach. The house itself was perfect! Very clean and lot's of toys, games, and entertainment for kids and adults. Internet worked very well and kitchen was well stocked. Great house. Lots of extras (bikes, beach towels, toys). Fantastic location. Only ten mins walk to the shops and restaurants and a block from the beach. Would stay again. We had an amazing time in Manzanita. The house was beautiful, spacious and extremely comfortable and relaxing. I would absolutely stay here again. The dart board in the garage was definitely a highlight for me. This is a really well-appointed, attractive condo/duplex. It's in a quiet area but within walking distance of stores, restaurants and the beach. We had a great stay here. Our family stayed here over Memorial Day Weekend and loved it! Great location, plenty of room and lots of games for family fun. Plus a great open kitchen for meals and chatting! This house was perfect. It was in a great location, very clean and had all the necessities that we needed. Also had an amazing kitchen. Wonderful house!!! Will visit again.